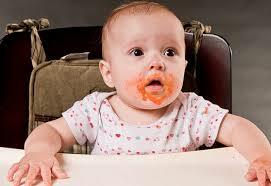 What foods to eat for a healthy baby - Mummy's Gone Mad! | Mummy's Gone Mad! Eating during pregnancy means taking your baby’s needs into consideration as well. A healthy diet is essential during pregnancy, but there are a few specific foods that are extra important when there is a developing baby involved. Your developing baby will get their nutrients from the mother’s body, soothe mother will encounter deficiencies before her baby is affected. Eating a variety of healthy foods can help prevent these deficiencies and also ensure the best development conditions to give your baby the best possible start in life. Babies need carbohydrates to grow, but simple carbohydrates such as white bread and white rice do not provide enough nutrients to support fetal development. You should rather choose foods such as brown rice, whole wheat bread and oatmeal. Pregnancy is the perfect time to try whole grains such as rye, barley, buckwheat and quinoa. These foods contain a wide range of nutrients that your baby needs. If you are the type of person that enjoys cereal for breakfast, then go out and look for cereals made from whole grains. The cereals that you choose should be fortified with folic acid, a vital nutrient which helps prevent the birth defect spina bifida. These are all another great source of folic acid. Spinach, Kale, Romaine lettuce and collard greens can provide calcium and iron as well, which are vital for building strong bones and the circulatory system of your baby. Leafy green vegetables can be cooked or eaten raw. Whipping up a fresh salad to go with your lean meat and good starches is a great idea for lunch or supper. All dairy products are an excellent source of protein and calcium and. Some of the dairy products on the market are also fortified with vitamin D, which helps babies efficiently use calcium. Milk, yogurt and low-fat cheese are all good additions to a pregnancy diet. For people who cannot or do not eat dairy, soy milk or calcium-fortified orange juice are other options for getting the nutrients that dairy would normally provide. Fish is a wonderfull source of protein and it contains essential omega-3 fatty acids that are very important in the developing fetal brain and eyes. Pregnant women should avoid any fish that has high levels of mercury, since this can harm the baby’s nervous system. It is recommended that pregnant women completely avoid tilefish, shark, swordfish and king mackerel. Pregnant women should rather aim to eat at least two servings per week of mackerel, herring, farm-raised rainbow trout, salmon, whitefish or sardines. Vegetables and fruits that are orange or bright yellow in colour contain high levels of vitamin A and carotenoids, specifically beta-carotene, which assists in developing the eyesight of your unborn child. The vegetables that you choose should include carrots, sweet potatoes and winter squash. Fruits that are high in carotenoids and vitamin A are apricots and cantaloupe, among others. According to professionals, pregnant women should eat at least one orange or yellow fruit or vegetable every day during pregnancy.